In this post, Barb Neligan, Senior Product Trainer for Education Networks of America, discusses the challenges of virtual training for customers, and how she used MadCap Flare to create an effective training experience. In June of 2015, the Education Networks of America (ENA) SmartVoice Product Manager and I were standing in front of a whiteboard filled with a list of cities at which we had onsite trainings scheduled in the coming weeks. We were talking about pain points. If you are involved in instructional design and delivery in any way, there is a very good chance you’ve had this same conversation with your team over the last few years. How do we reduce training costs for our customers without reducing quality? How do we make it easier for our customers to attend training? ENA provides transformative technology solutions engineered for education and library communities. 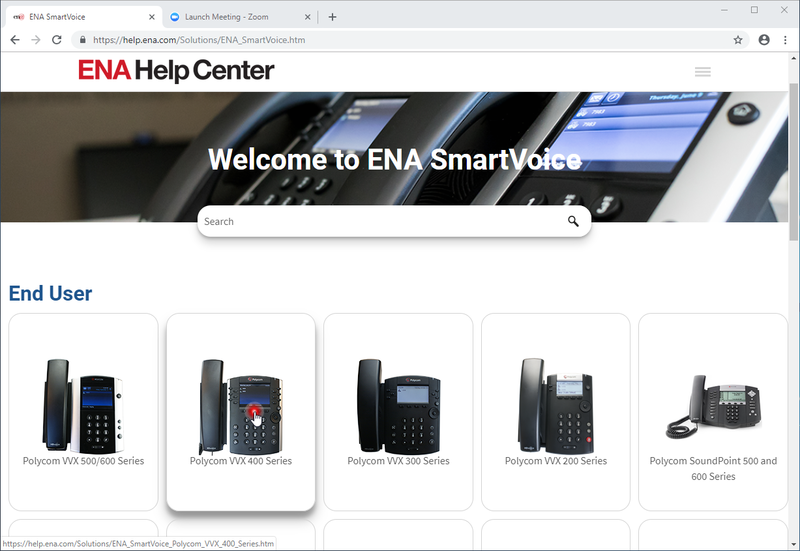 One of those solutions, and the one for which we deliver the highest volume of training, is ENA SmartVoice, our Voice over IP communication solution. In short, we install a lot of phone systems in libraries and K-12 school districts. For an implementation to go smoothly, it is critical that main office staff and administrators be absolutely comfortable managing and using their new phone system. This group, almost without exception, is pulled in multiple directions, managing a workload that is over-capacity. This group is always looking for ways to stretch their training dollars and maximize the value of the time they spend in training. School districts and library systems typically include multiple sites. As a result, “onsite” training doesn’t always mean “their site.” In larger districts and library systems, staff still often have the added time and planning requirement of leaving their building and travelling to a central location to participate in training. One of the ways we addressed these challenges was to develop a synchronous virtual training option for ENA SmartVoice. We use Video Collaboration powered by Zoom for the session platform, and our HTML5 online help center built in MadCap Flare as the platform for our training content and materials. Then we do a screen share of the help center to orient participants to the content for the product we are covering during the session. 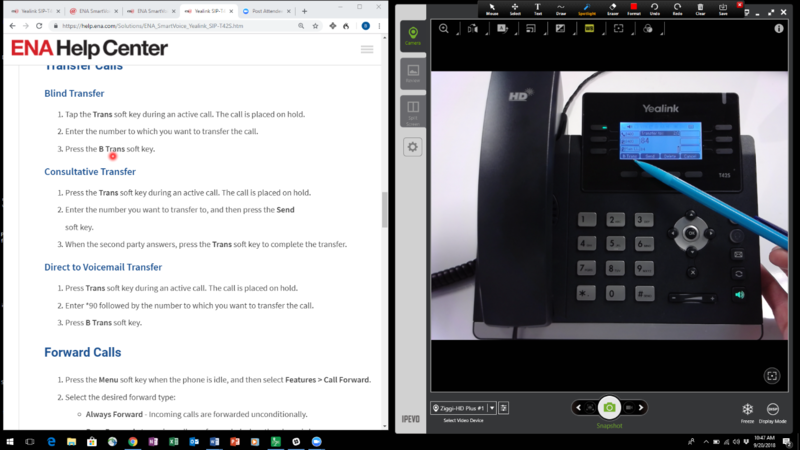 Throughout the session, we split the screen between the related content in the help center and a live feed of the phone or online portal we are covering. Note how when we shrink the webpage down to half the screen, the content becomes responsive and we see the hamburger menu in the upper right of the screen. We can shrink the screen and not lose any content real estate to the side menu, and we don’t lose any navigation functionality. We point participants to the downloadable print resources for each product. This ensures the customer is accessing the most current content. During the sessions, we follow the flow of content on the page in the online help center. Not needing to create a PowerPoint deck for each phone model and having to update it every time we update content has saved us a great deal of time and energy. Our PowerPoint deck is now typically limited to three slides. They are: session title; session objectives; and the directions to help.ena.com. Once we do the screen share of the help center, we stay there. Two years ago, we began giving customers the option to purchase onsite training or participate in virtual training at no additional cost. The goal of product training at ENA is not revenue generation, it is customer success. In the onsite model, however, we need to at least charge enough to cover travel expenses. As you might guess, most customers choose the virtual option. 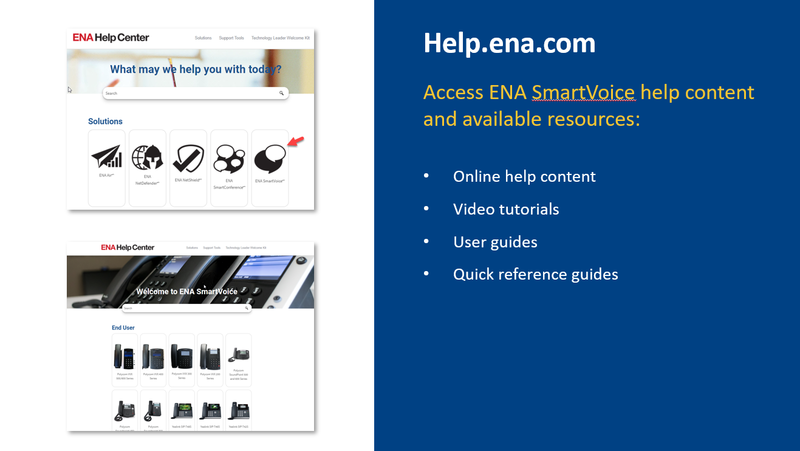 Today, over 95% of ENA SmartVoice customer-facing product training is delivered virtually, supported by the content in our online help center. We are also receiving positive customer feedback in the second challenge area of making it easier for customers to attend training. It is much easier for a staff member to participate in a training session from their desk or office, than to travel to a central location in their building or another building on campus. And customer administrators are not tasked with finding and preparing a central physical location for the session. Of course, the most important thing is the effectiveness of the training. Customer feedback on the effectiveness of virtual training is positive and inline with feedback on the effectiveness of onsite training. Because the learning objectives of these sessions are the application of technical skills, the virtual training model with support from content in the online help center works well. The benefits are not just customer-centric. Internally, we are experiencing the benefit of being able to devote the time formerly spent travelling to continuous improvement and new training development. Our journey of addressing the challenges of reducing training costs for our customers without reducing quality and making it easier for our customers to attend training, is just that, a journey. While we’ve made considerable progress, there will always be next steps ahead of us. Here are our immediate goals in the content, instructional design and training delivery areas and the MadCap Flare feature that supports them. Add a self-service scheduling tool to help.ena.com. Organize the flow of help center content for all phone models around the “readiness checksheet” we use in training. Currently, the flow of the content in the help center varies between the phone models most recently added to our product offering, and the ones we have offered for years. We want to clean that up, and match it to the “readiness checksheet” we use in training. Then, with thoughtful use of condition tags, use that content as a single source for printable Quick Reference Guides. Our plan is to keep moving ahead, one step at a time, and continue to leverage MadCap Flare to do so. Barb Neligan began her learning and development career in 1988 with General Motor’s Saturn Corporation. It has been an amazing 30 years and counting learning journey, during which she has worked with clients in industries ranging from telecommunications to training simulations to tractor supplies. In her current role as Senior Product Trainer for Education Networks of America, she is responsible for the design and delivery of ENA’s product knowledge and use curriculum, which includes creating and managing the content for ENA’s customer-facing help center.